Pivot tables are one of Excel’s most outstanding features. They allow fast dynamic and interactive analysis of data from the workbook or from any number of external sources. 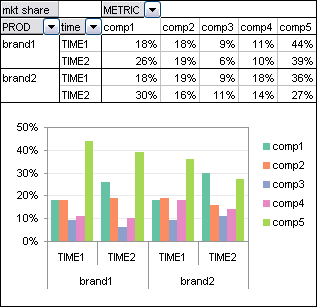 Pivot charts go hand in hand with pivot tables in showing the data visually. I am not a staunch fan of pivot charts: they allow only a limited selection of chart types, and their formatting possibilities are not as extensive as those of regular charts. however, for a quick look into a new data set, they are hard to beat. Later when I know what I want to show, I make custom regular charts, with data often derived from pivot tables. 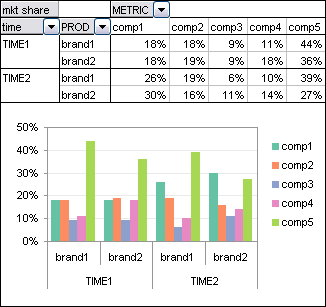 In Visualization Challenge – How to show market share changes? our colleague Chandoo presented the following data and challenged his readers to display it meaningfully. 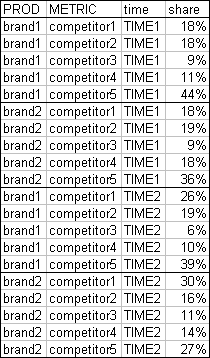 The data shows market share for two brands and five competing retailers, at two times. The challenge was to show the trends over time. I took on this challenge in Challenge – Show Market Share Changes. While working on this challenge, I realized that the data made for a good example of the power of pivot tables for fast and detailed analysis. I’ve rearranged Chandoo’s sample data into the form required for an effective pivot table. There are no blank rows or columns, the first row has headers (field names), and there is one row (record) per observation. To create a pivot table, select all of the data or a single cell within the data (Excel will try to use the contiguous range surrounding the selected cell), and from the Data menu or the Insert tab in 2007, choose Pivot Table. To include a pivot chart, you can choose the appropriate option in the dialogs, or you can select the pivot table and insert a chart, or (and this can be dangerous) you can select an existing chart, edit the source data, click in the Data Range entry box, and click in the pivot table. This last operation is dangerous, because it converts the chart into a pivot chart, and pivot charts cannot be reverted to regular charts. 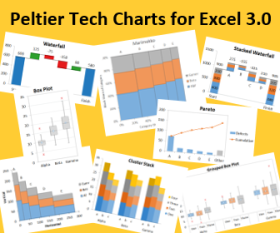 Of course, it is possible to create Regular Charts from Pivot Tables. The pivot chart is joined to the pivot table at the hip. Any changes to the pivot table are reflected in the pivot chart, and vice versa. For clarity, I have hidden the pivot buttons from these pivot charts. They are redundant since the pivot table and chart are so close together, and they consume valuable chart real estate. This first arrangement shows each competitor as a different color series. This is fine, but there is too much spacial separation between the two times to allow a good assessment of the trends. This is easy to fix with a pivot table. You can click and drag the gray field buttons around to change the arrangement instantly. So I dragged the time field inside the product field. The times are closer, but the trends are still not so easy to discern. Okay, maybe the competitors shouldn’t rank their own series. I dragged the competitor field down to the rows area and the product field up to the columns area. Hmm, the times are again too far apart. Click, drag. Okay, the times are pretty close now, but the comparison between brands is given more emphasis. … while this view compares the two brands for each competitor. This analysis gave me just enough insight to know how I should build the chart I answered Chandoo’s challenge with. It was not a pivot chart, nor was it based directly on a pivot table, but it utilized the insights from the analysis above. I created a panel chart with each competitor in its own vertical panel, and with lines connecting the data. I’ll show the particular data arrangement and protocol I used to create this chart in an upcoming post. Stay tuned. Posted: Tuesday, November 11th, 2008 under Pivot Tables. Maybe I’m missing something. 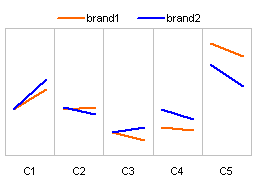 Is the example suppose to show what the market looks like excluding Brand 1 and Brand 2? If I’m the client here, I would need to know what are Brand 1 and Brand 2 shares of their respective markets. Otherwise, the exercise doesn’t make a lot of sense.